The Super Eagles of Nigeria has started training in London ahead of the international friendly match against the Orlovi (the Eagles) of Serbia on Tuesday night at the Hive Stadium. The Nigerian team had 7 aside training session with the team comprising of Francis Uzoho, Gabriel Okechukwu, John Ogu, Tyronne Ebuehi, Uche Agbo, Junior Ajayi and Kenneth Omeruo emerging victorious. Information obtained from the Super Eagles verified Twitter handle stated that Oghenekaro Etebo missed the training because he is still battling with fitness issues, this was the same reason why he also missed the game against Poland on Friday night. Oghenekaro Etebo the Las Palmas of Spain midfielder is now a big doubt for the Super Eagles of Nigeria international friendly against the Orlovi (the Eagles) of Serbia at The Hive Stadium on Tuesday night. 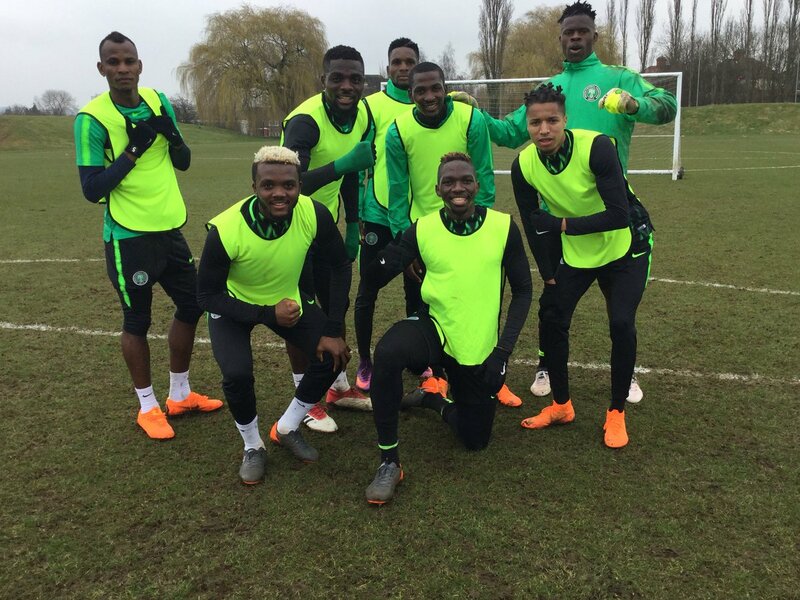 However the trio of Gabriel Okechukwu, Junior Ajayi, and Mikel Agu who also missed Friday’s friendly against Poland but were joined by other players in London yesterday , were part of the training session today (Sunday). “Our first training session at the Barnet FC Stadium in London went smoothly. New arrivals Junior Ajayi, Gabriel Okechukwu, Mikel Agu were actively involved but Oghenekaro Etebo was on the sidelines,” the Super Eagles handle explained on Sunday. The Super Eagles of Nigeria will do battle against Serbia at The Hive stadium on Tuesday 27 march by 8.00pm, as the Super Eagles would be seeking to consolidate on their win against Poland, while Serbia on the other hand will be working towards redeeming their image after losing 2-1 to Morocco in their last pre-World Cup friendly match. Nigeria Vs Serbia Player Rating: How Did The Super Eagles Players Perform? March 28, 2018 Obodo Charles Comments Off on Nigeria Vs Serbia Player Rating: How Did The Super Eagles Players Perform?